Title One Programs are eligible to order our popular book collections at special discounts! These books and books with audio CD have garnered 25 national awards and distinctions. To access the Title One order form, please click on the PDF below. When printing the order form, please note that it consists of two legal sized (14” x 8.5”) pages. and audio clips at www.tortugapress.com. To make book distributions even more exciting, consider inviting Matthew Gollub to your school or reading conference. 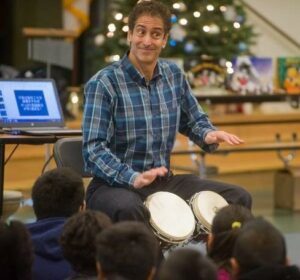 An award winning author and professional speaker, Matthew delights audiences nationwide with his mix of drumming, slides and storytelling in three languages English, Spanish and Japanese. 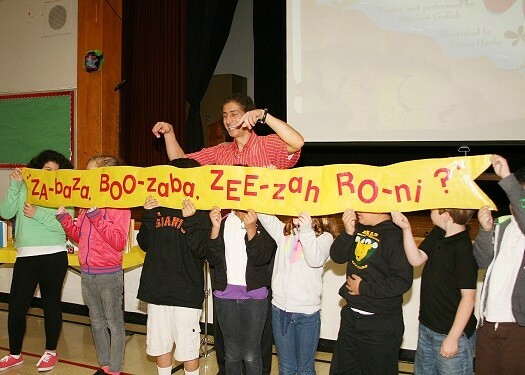 He has performed at over 1,000 schools where teachers describe his mix of talents as “unbelievably dynamic.” He specializes in author assemblies for grades pre-K through 8th and bilingual family reading presentations at night. For more information, please visit www.matthewgollub.com or email mg@matthewgollub.com.